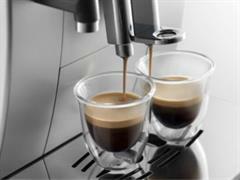 Compact bean-to-cup machine with the De’Longhi patented automatic cappuccino system. Your perfect cappuccino at the touch of a button. Furthermore the “my milk button” gives you the possibility to choose among latte Macchiato, Caffelate and milk. Equipped with 2 text lines display with the possibility to customize your coffee and as you prefer, active cup warmer and water filter. Enjoy a perfect mix of pleasure. A creamy cappuccino, with dense milk foam, always at the perfect temperature … until the last drop. The automatic cleaning function integrated in the froth regulating knob guarantees an easy and secure cleaning of all milk frother components. Apart from the direct Cappuccino button, discover the world of milk entering in the Milk menu where you can choose among Caffelatte, Latte Macchiato , Flat White and hot milk. 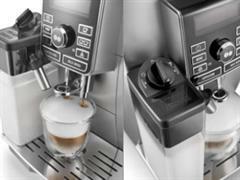 Allows you to prepare two perfect crema-rich cups of coffee in a single brewing cycle . Adjustable coffee dispenser from 86 to 142 mm height.